The final episode of “M*A*S*H” was co-written with eight collaborators and directed by star Alan Alda. Despite the photo ops and historic border crossings that emerged from the on-again off-again Korean summit this past spring, the Korean War has yet to come to a formal close because South Korea never signed the 1953 truce ending hostilities. For many Americans, the conflict ended on February 28, 1983, when the long-running television series set during the war, M*A*S*H, aired its final episode. The series had an incredible 11-year run (nearly four times the length of the actual Korean conflict, 1950–1953). M*A*S*H followed the adventures—some boozy, philandering, and anti-authoritarian, and others heroic, noble, and lifesaving—of doctors and nurses of the fictional 4077 mobile army surgical hospital. Captains Hawkeye Pierce and B.J. 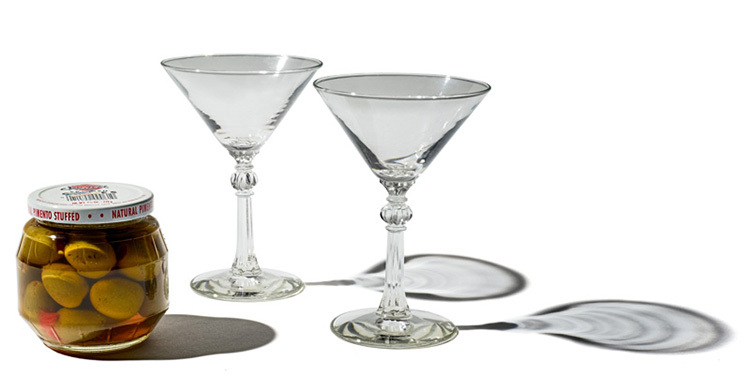 Hunnicutt frequently served martinis from these glasses, with gin they distilled themselves. 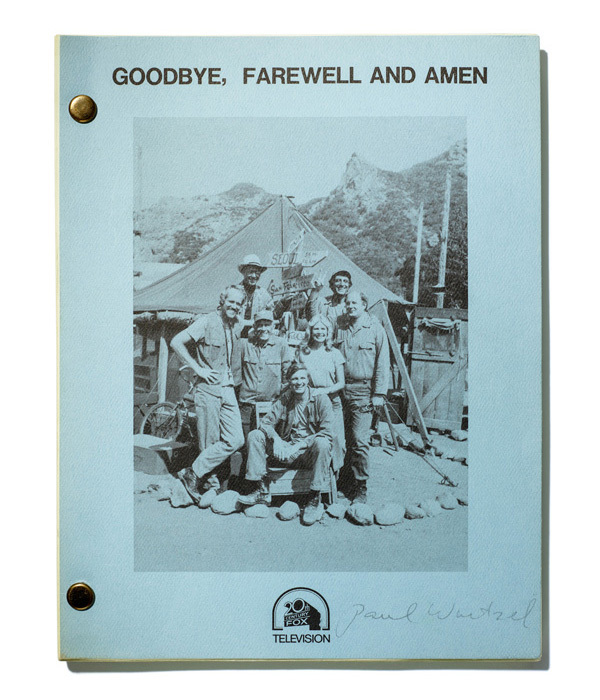 The M*A*S*H finale, “Goodbye, Farewell and Amen,” remains the most watched scripted television episode of all time. It is important to note, however, that the episode aired in a different television landscape—long before streaming and binge watching were possible, when programming was dominated by three networks offering limited choices. The finale smashed previous viewing records, including those held by the 1980 Season 4 premiere of Dallas, which continued the prime time soap opera’s “who shot J.R.?” mystery, and the finale for the 1977 miniseries Roots, which dramatized author Alex Haley’s family history from enslavement in West Africa to liberation after the Civil War. 1983 proved a watershed year for television audiences, as the most watched made-for-TV movie, The Day After, also debuted that year. The movie, which graphically depicted the ravages of nuclear war, was a traumatizing collective experience during the height of the Reagan-era arms race. Despite weeks of hype and debate preceding it and the network providing counselors on toll-free numbers following the show, the movie garnered 77.4 million viewers—far fewer than the M*A*S*H finale. 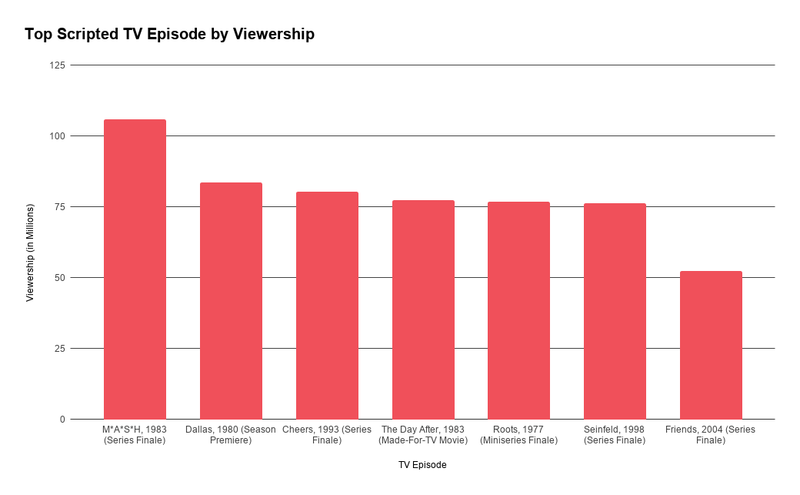 The final episodes of perennial crowd-pleasing 1990s-era sitcoms, including Cheers, Seinfeld, and Friends did not surpass the M*A*S*H audience either. 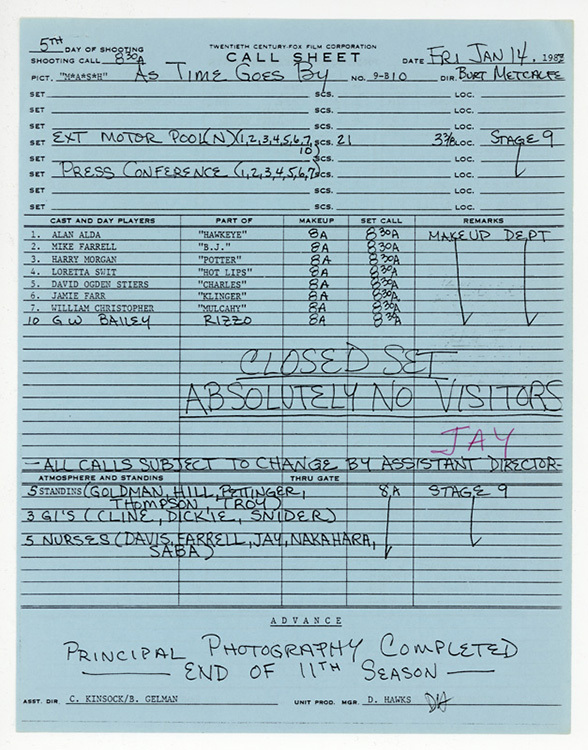 Call sheet from 20th Century Fox showing that final exterior photography took place at Malibu Creek State Park on Wednesday, December 8, 1982. One reason for the high viewership is that the show lasted a whopping two-and-a-half hours. The producers lengthened the episode to incorporate a real-life brush fire that devastated the external M*A*S*H set in the Santa Monica Mountains in late 1982. Instead of rebuilding the set, the writers wrote the fire into the script, in which North Korean incendiary devices spark a fast-moving blaze that forces the 4077 to “bug out” to another location. In addition to using real fire footage, editors also reused scenes from an earlier episode (“Bug Out,” Season 5, Episode 1) in which an encroaching battle forces the 4077 to evacuate after Col. Sherman Potter finally quells false rumors of an impending “bug out” drill. The same shots of tents getting folded up, trucks pulling out, and the lowering of the crate serving as the basket for the basketball court appear in nearly the same sequence in both episodes. In one of the closing scenes of the finale, shot at the mountain, the M*A*S*H crew dismantles the iconic signpost to “take their hometowns home.” Nurse Kellye Yamato grabs Honolulu and B.J. Hunnicutt swipes San Francisco, which rests between the handlebar and headlight of his motorbike as he rides away. Throughout the show’s 11-year run, the placards on the post changed towns and positions, making it likely that there were multiple signs or that the prop was reassembled occasionally. 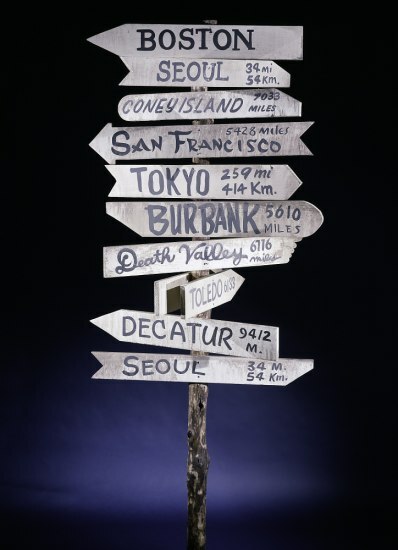 Los Angeles, Honolulu, Indianapolis, and two Tokyos appear in different shows or publicity shots, but not on the museum’s signpost as pictured here. Pointing the way to any place but here, this prop reflects the characters' humorous efforts to cope with the horrors of war. M*A*S*H was still garnering high ratings when the creative team decided to end the series. According to actor, director, and writer Alan Alda, the team wanted to ensure that show’s quality did not deteriorate. “I felt that we were running out of steam, and repeating ourselves. And I personally wanted to go out on a high note, artistically,” Alda said during a phone interview in 2017. 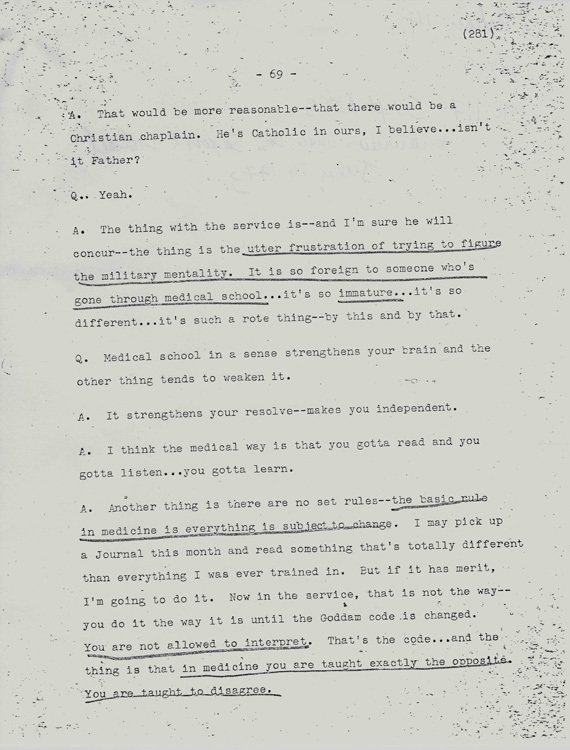 Interview transcript used by “M*A*S*H” writers as inspiration and research for story lines and characters. Alda, who wrote several episodes, explained that many story ideas came from more than 50 interviews conducted by head writer Larry Gelbart with medical personnel and soldiers who had served in Korea and Vietnam. Several of these interviews are in the Smithsonian archives today. “All of us who wrote for the show would pick through these reams of interviews, and look for one line from an interview that could be the basis of a story. You’d see all these sentences underlined, that other writers had mined,” he said. 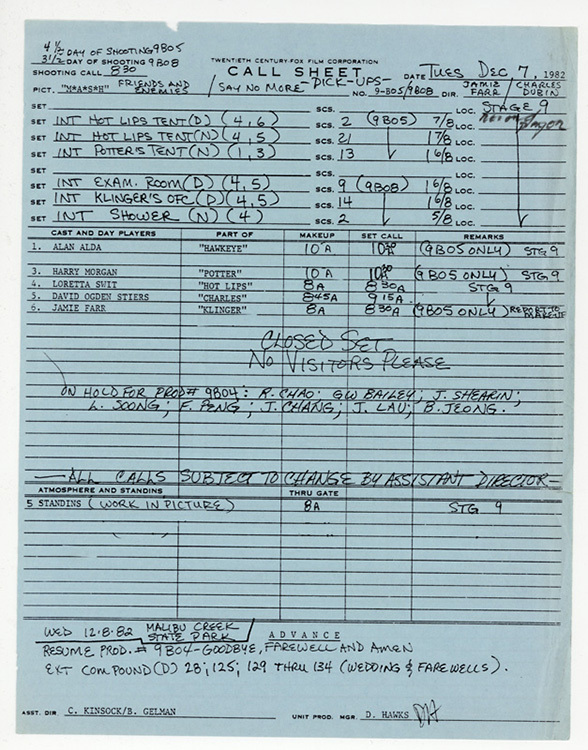 Call sheet for the final day of “M*A*S*H” filming, indicating the set was closed and preparations had been made for a press conference to follow. Because of shooting schedules and some effort to keep details about the finale under wraps, the episode was shot and edited earlier in the season. The last filming session for M*A*S*H was for the penultimate episode, “As Time Goes By,” in which Major Margaret Houlihan spearheads an effort to bury a time capsule to commemorate the unit’s time together, while Hawkeye and B.J. collect less serious items for an alternative memorial. Although the set was “closed,” hundreds of journalists and camerapeople were in the wings to record the show’s final wrap. When the last shot was taken, the actors were whisked away from Sound Stage 9 to the 20th Century Fox commissary for a press conference. Emotional sound bites from the stars appeared in local and national news outlets and helped build the hype and expectation for the M*A*S*H finale. The 256 episodes live on lucratively in syndication and can frequently be seen on television. So fans who share B.J.’s aversion to parting don’t have to say goodbye. Some scholars and social historians debate the impact of the groundbreaking show. The story lines reflect myriad influences during its original run, including protest over the Vietnam War, distrust in the government sparked by the Watergate scandal, the blossoming of the women’s movement, the continued struggle for civil rights, and the increased focus on individual fulfillment. While a few critics accuse the show of displaying a preachy brand of moral superiority, many believe it represented the peak of network television. All agree, however, that M*A*S*H was and remains a cultural institution that left an indelible mark on its viewers. Lucy Harvey is a program assistant in the Division of Armed Forces History who also volunteers with the Division of Culture and the Arts. She has also blogged about M*A*S*H’s costumes, actor Alan Alda’s reflections on the show, the museum’s popular M*A*S*H exhibition that once existed at this museum.